Can you tell me about this, and the value? It's about 60+ cm diameter and more than 50 cm high. This is a Japanese "Hibachi" looking flowerpot from around the turn of the century. A "Hibachi" is really a jar for storing coal rather then a flowerpot. From the presence of a drainage hole in the base I feel we should expect this to be flowerpot instead why we also should put a little question mark to its age, because the old ones should really be used for storing coal. If it had been a fish basin I feel it should really have been glazed all the way down on the inside. 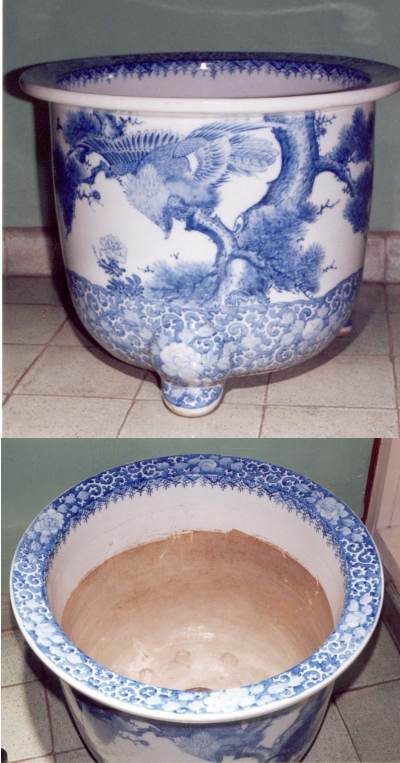 It is still hand decorated in blue and white and seems to be of a very good quality. The "flowery" and detailed decoration in soft blue hues makes it likely in my view that it comes from the Japanese Seto area. Best guess on age is that it is from the late 19th century but whatever it exact age is, it is not so old that this have too much an impact on the value. The good is however good, it looks nice, and I believe it in Europe would probably have been around US $ 500 to 1,000 in the antiques trade. One problem with pieces of this size is the cost of shipping, which makes the market limited.